When starting out in the anti-fraud field, it may be common to view things as black and white; there is the fraudster, who is bad and deserves to be punished, and the victim, who is innocent and deserves to have their losses recouped. However, as many veteran fraud examiners know, things are rarely that clear cut. 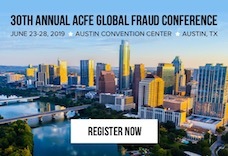 In her session “Encounters with a Sociopath: The Saga of a Million-Dollar Fraud” at the 29th Annual ACFE Global Fraud Conference, Ginny Tate, CFE, CIRA, EA, took attendees through the wild story of a fraud where the line between victim and enabler was blurred. Tate, who is the president of FAI International, Forensic Accounting & Investigations, a division of the EP Global, described a case she worked on that began when the staff of a wealthy investor reached out to her team. Using aliases, Tate introduced attendees to “Edgar,” “Tonya” and “Blake.” Blake and Tonya ran an auto auction that had a number of shady dealings. Edgar was a wealthy older man who had become enamored with Tonya, who was 25 years his junior, and invested $1.5 million into the auction. Edgar had a number of businesses he invested in and was usually savvy about making sure they were profitable. However, his accountant noticed that the auto auction was losing money and worried that Edgar was blinded by his feelings for Tonya, so the accountant hired Tate’s team to investigate. They quickly discovered that a variety of crimes were being committed by a charismatic employee, Blake. Tate explained that Blake’s dominating personality had managed to rope in a network of employees and others connected to the auction to help defraud Edgar. “Fraudsters often have a special charm,” explained Tate. “They’re a little more dangerous and they’re a little more interesting than the rest of us.” Blake also happened to meet the clinical criteria for antisocial personality disorder. Once Tate and her team had amassed evidence, they went to Edgar to ask permission to place security cameras in the lobby and offices of the auction in order to corroborate their theories. Instead of agreeing, the way a fraud victim might normally do to get justice, he refused. He thought it was insulting to Tonya and the other employees. Around this time, he took Tonya to the Super Bowl on a private jet, took her on a dove hunting trip to South America and whisked her away on a variety of other expensive trips. Since Edgar wouldn’t give them access to the offices, Tate and her team ended up setting up a number of targeted sting operations and finally got an insider to help as well. They discovered, with no uncertainty, that Blake was stealing hundreds of thousands from the business with help from Tonya. At this time Edgar had purchased a house for Tonya and was often paying Tonya’s children’s car payments. Tonya’s children were also on the auction’s payroll despite not working there. When presented with overwhelming evidence, Edgar still refused to fire Tonya or press charges against her or Blake. Moreover, when Tate’s team attempted sting operations, she noticed that Tonya and Blake seemed to always be one step ahead. Tate determined that Edgar was occasionally feeding information to Tonya because he didn’t want her to get caught. Eventually Edgar chose the only option he saw that would not end in jail time for Tonya. He filed for bankruptcy on behalf of the auction. The day they filed, they were finally able to open up the books and call in all outstanding loans. Edgar had sunk around $3 million total in the business and actually made back around $1 million that day since the money was finally being handled by someone other than Blake or Tonya.